The poll summary is here. The last UT/TT poll had Abbott up 47-36 in February, so according to these guys both candidates have lost some support to the great “undecided” crowd. Of course, that last poll was a two-candidate choice, unlike the November poll, so once again direct comparisons are a bit dicey. Maybe they will be consistent about that from here on. I sure hope so. I’m not going to spend much time on this. For one thing, the UT/Trib pollsters haven’t earned my trust back since their debacle in the primaries. Yes, I know, a general election is different, but still. I don’t plan to put any faith in their results until I see how they fare in this election. I’ll track these and put them on the sidebar like all others that I see, but they’re just another set of numbers until they prove they’re more than that. Beyond that, I have two complaints about the UT/Trib polls that have yet to be acknowledged, much less addressed. For one, Henson and Shaw have a bizarre tendency to ignore their own past data in their discussions of the poll du jour. 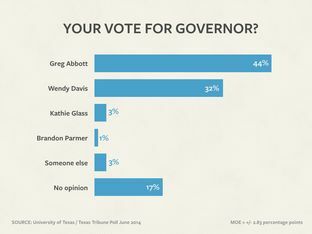 How can you claim that Greg Abbott is killing it among Anglo voters when your own data shows that he’s not doing as well as either Mitt Romney or Rick Perry? It’s like each result exists in a vacuum, and it gets fit into whatever the narrative for that election happens to be. You’ve got all this data – use it, for crying out loud. Two, they really need to explain their turnout assumptions and why they think the electorate will look like it does. This is especially the case given the not-really-random nature of their own polls, but it’s true for any pollster out there, including reputable firms and various hapless hacks: What do you think the 2014 electorate will look like, and why? If your polls are based on the assumption that 2014 will resemble 2010, well, it’s not surprising that you’d show Abbott with a double-digit lead. Maybe that will turn out to be a correct assumption, but don’t just make it without explaining why you’re making it. Everybody knows that Democrats, both nationally and in Texas, are working to change the turnout model for this year, and hopefully for non-Presidential years going forward. What I don’t know – what I don’t think anybody knows right now – is how successful they may be. Pollsters need to make a guess about that, and they need to explain the guess they make. Otherwise, they’re just polling the last election. That’s often a sound strategy – it’s what I recommended they consider doing for polling primaries – but it’s not the be-all and end-all, especially when you know there are other factors in play. Tell me what you think the electorate will look like, and why. I don’t think I’m asking for too much here. Republicans, after the 2010 Census and election victories that year “Struck gold,” in Texas in their efforts to hold on to majority control of state government until at least 2020. Neither their picture voter I.D. law or their ‘gerrymandered maps’ were struck down by the courts in the end. Their control may not last until 2020 but they are doing everything they can to keep it. Here’s my short list: First, make it harder to exercise the franchise. Suppress voting by disenfranchising the young and mobile, along with the elderly, think current correct in every way I.D., dilute the voting strength in Democratic leaning cities, example, Austin, and have a lot of weird shapes on maps as voting districts by grouping or separating minorities to lessen their influence at the polls. Democrats, especially black and Hispanic officeholders and interest groups, were the forces behind the racial separation of political districts in this state. Look at the maps drawn by the Democrat-controlled legislature in 1991 to carve apart neighborhoods block by block to create separate congressional districts for Craig Washington and Ben Reyes (although Gene Green took the seat). Even today, the reason the east side of the 1100 block of Nashua is in one voting precinct and the west side of the street is in a different one is a relic from that carving. Individual city blocks were selected out based on ethnic or racial composition and grouped into districts. Both sides of the 1100 block of Prince are in the same district, but the west side of the 1200 block is in different ones, then the 1300 and 1400 blocks are in the second district, but the 1500 block is split again. Abbott will win by 15 plus. Polling has gotten so spotty lately. It is a bad climate for a Dem which really affects our ability to determine how much BG Texas really can change the dynamic. Davis will wish she had not run come November but she knew, to her credit, she couldn’t hold her senate seat either. She chose to listen to the to the chatter and entered an unwinable race. Just ask Julian Castro–if this race was winable, he would have ran. They needed a guinea pig and she accepted. The focus needs to be clearly on the Lt. Gov race where there is a real, I suspect race to be one within 5% points one way or the other.